As a follow up to the DiGiorno Pizza Critique, I spent a little time thinking about other types of marketers and created a revised post called "10 Tips for Twitter UnMarketing." You can find it here and add your .02 cents. If you are curious about the title, I'm just not a real fan of the term "Social Media Marketing." I realize it's the hot buzz word - but it makes me uncomfortable. Maybe it's just semantics. I don't know. We are migrating from the post industrial product-centric organizational model that is heavily task-focused -- to post millenial people-centric models that are customer focused (all tasks wrapped around the customer). It's a revolution that is happening at the pace of an evolution -- and can be awkward and painful as companies walk through the change. Perhaps that's why so many companies find delivering great experiences an elusive goal. In the wake of this change, marketing is undergoing important shifts. Entirely new skill sets are required. Channel proliferation is happening at light speed. The way we go to market is different -- sometimes less expensive but often much more challenging to manage. Our dialog has changed. Marketing today is MUCH less about pushing an agenda and message through aggressive outbound communications, programs and campaigns. Today, it is MUCH MORE about delivering the experience fundamentals, being excellent and remarkable -- and helping people discover us by building authentic relationships, by allowing others to "taste and see" -- by experiencing. So that's why I used the term "Un Marketing." This isn't about marketing. It's about customer experience. While I write about a lot of "stuff," my focus has been on creating great dialog with customers, and designing creating great experiences that are people focused. Social media fits in because it's a rapidly growing, dynamic experience tool. It's important to pay attention to what's going on and learn from specialists , (I don't like the term "expert either) who are actively engaged in various aspects of social media. I can't thank you enough for your comments, tweets, DMs, IMs and emails. Please keep them coming! Ad age reported today that Kraft/Digiorno Pizza and Weber Shandwick PR have teamed on the launch of Digiorno's new Flatbread Pizzas. Digiorno will deliver free pizzas to tweetups in LA, New York and Chicago. The Twitter component is part of a national launch involving print and television. The announcement highlights the brand's plans to reach out to "influential" tweeters. Okay - I think this is a GREAT idea. Tweeters are vocal, fiercely loyal and when you get us together, it's even better. Get a great idea out - make us love your product and we'll push the good news up the flagpole. We love brands that love us, and nothing says love like schwag, food and conversation! Yay! Define "influence" in advance. The Digiorno There's no definition of what "influence" is. I find it hard to believe they'll be launching this without that definition in place. The article eludes to number of followers - but any veteran on twitter will attest to the sheisters out there who have numbers but LITTLE dialog or influence. Brands should look at followers against the backdrop of other elements, like overall voice (on Twitter and other social networks), reach (comments, re-tweets, links in), affiliations (e.g. social media club, DMA, others) and activity (travel, conferences, speaking where word may be spread). Establish Your Angle(s). Beyond influence and geography, it's important to think about specialization/demographic. Social Media makes it easy to target individuals with specific areas of influence. Walmart and 800-FLOWERS are just two brands that have actively targeted Mommy Bloggers. I'm friends with a few of the Walmart 11 moms - and a few have frugal living columns. SXSW featured a panel with Chris Brogan and others called "Dad is the New Mom." I have a fun cadre of foodies in my Tweetdeck group. It's important to define the angle you're going to "shoot from" for "focused tweets." For example, for Digiorno, I would ask the following: Is your angle economics, making mom or dad's life easier, or great tasting pizza... or all of the above. Choose a mix that matters most to generate the best word-of-mouth! Challenge Geographical Constraints. Don't assume you'll find the best and most influential tweeters for your brand will be found in LA, New York and Chicago - there are plenty of active, chatty hubs in other areas of the country, as well. If your product is aces for middle-american housewives - go get 'em! Targeting is not dead -- in fact it's even easier with social media. Make it Easy to Get Involved. The article on Ad Age provides no way for people to engage with Digiorno. There's no page on the website - no available URL that details the new program. What happens if an influential tweeter reads this and says "I have an influential tweetup this week! I want Pizza!!" How do they make their case to Kraft? At a minimum, brands should offer a web page with details and criteria. Better yet -they're wise to add some comment functionality to the announcement page, allowing people to nominate themselves or their events in a visible way to others. Tweet Unto Others. There's not one Twitter profile listed in the Kraft/Weber article on Ad Age. Furthermore, after some searching on Twitter, it seems Kraft is relatively unprepared to meet people from a brand perspective on Twitter. (Administering slap to PR agency hand!) This should have been handled before the release is sent out. When I looked on Twitter @kraft pulled up a person's profile with a link to an article about dead man's sperm. Nice! When I looked up @digiorno two accounts were listed -- without any followers, branded icons OR tweets. That's a shame because it's not hard to lay this groundwork. Put up a clever, branded icon. Seed your accounts with some tweets and information- engage some people in dialog on Twitter to create a tweet history in advance of any press releases. Oh - and while I'm on the subject - follow Twitter best practices. Do not use Twitter to BROADCAST your brand message. Simply tell people about the promotion, ask them what they think and create an open line of communication with the twitterverse. Finally, remember that once you are finished with your campaign - you're not finished on Twitter. Develop a plan for how your brand will continue on Twitter after your campaign is over. Consolidate #Results. Do you want to demonstrate participation and make it easier to track word of mouth and discussion regarding your campaign? Why not create a hashtag to track buzz and centralize dialog about your promotion? 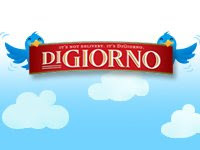 It would be relatively easy to give something away for free with a simple request like this: "Participants will merely be asked to include "#digiorno in their tweet updates during the event". Focus Beyond Tweets. Just because the campaign component is Twitter focused, your scope should not be limited to Twitter alone. You'll want to look at follow-up posts (like this one) and articles on popular sites and blogs - and you should be sure to comment on posts, and respond to tweets, as well. Recognize that everything starts the minute the press release goes out ... and promotion continues as campaigns ensue. "Shout out" the quick wins and results on the fly (e.g. Announced yesterday and 1000 people signed up!) to encourage follow up posts and mentions. Reward the people who volunteer but don't get selected with consolation prizes, like coupons or schwag. Take a page from Dell or Zappos and celebrate success publicly. Publish a post or rich media case study to highlight lessons learned and celebrate success. You don't have to tell all -- just tell enough to communicate success or how you have learned. I"m sure there's more to say on this topic, but I'm attempting to be brief here. Feel free to add your comments about how to create success with programs like these. Thanks for listening! This Friday at 12:30 pm, I'll be interviewed by John Munsell and Paul Chaney on the User Friendly Thinking Show on Blog Talk Radio. The topic of our discussion will be customer experience management - demystifying the term, talking about the move to customer centricity is driving business change and how CEM will impact business and your job in the future. I really hope you'll join us, and look forward to talking to folks in Q&A. Click here for the link to the Blogtalk radio program! This discussion will serve as a teaser into my upcoming Marketing Profs Premium Webinar on Customer Experience Management, which will be held on April 30th. The webinar is free for individuals with Premium Mprofs membership (It's low-cost, high value. I'm a Member! ), and you can also pay for the webinar itself. We'll take a deeper dive and have visuals for this discussion. 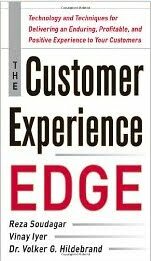 Click here for the link to April 30th Marketing Profs Webinar on CX with yours truly! In between paying client gigs and crazy projects, I'm working on a redesign of the Live Path site and Experience Architect Weblog. Stay tuned for more... I'm aware of my usability hypocrisy on the blog now, and glad that most of you feel the content is worth the read, regardless of the crowded UI! Thanks for engaging with me.